This is the cover of a recent issue of the Toronto Star, Canada’s largest-circulation newspaper, as the country prepares to welcome the first tranche of Syrian refugees in the newly elected Liberal government’s resettlement program. The front-page photo is accompanied by a heartfelt editorial welcoming the freshly arrived Syrians and briefing them on life in Canada. Prime Minister Justin Trudeau, who plans to meet the refugees as they arrive, told the House of Commons that the first plane carrying more than 160 refugees was expected to land from Beirut at 9:15 p.m. Eastern Thursday, December 10 at Toronto’s international airport. A second plane was scheduled to carry more refugees from Beirut to Montreal over the weekend. “Resettling refugees demonstrates our commitment to Canadians, and to the world, that Canada understands that we can and must do more,” Trudeau said during the question period in Parliament. 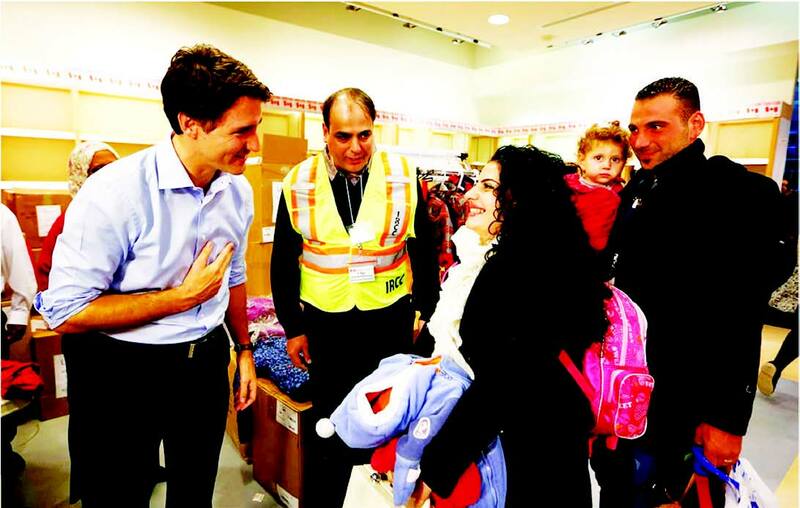 Trudeau’s government committed to resettling 25,000 Syrian refugees by the end of February next year, with 10,000 set to arrive by the end of this year. Canadian Immigration Minister John McCallum told reporters at a news conference that 11,932 refugee applications were already being processed in Lebanon, Jordan, and Turkey — the three countries with the largest populations of Syrian refugees. In preparation for the influx of newcomers, temporary processing centers have been set up at airports in Montreal and Toronto as Canadian authorities transition refugees into permanent housing across the country. Trump’s comments have been met with both outcry and support in America and mark a major political shift as the nature of Islam, and Muslims in general, becomes one of the domineering topics of the U.S. election cycle so far. A new poll released by the Washington-based Brookings Institution found that “American views of Muslims are strikingly partisan.” According to the poll’s findings, 67 percent of Democrats express favorable views of Muslims, contrasted with only 41 percent of Republicans. When asked about Islam in general, 51 percent of Democrats view the religion favorably, compared to 27 percent of Republicans. Canadians generally have more positive views. Polls in September found that three-quarters of Canadians wanted to accept more refugees into the country. However, a November poll conducted after the Paris attacks and the announcement of the Liberal government’s new policy saw a drop in support, with 51 percent opposing Ottawa’s measures. Trudeau had made the 25,000-refugee target an important element of his campaign platform as early as last March and doubled down as Canada’s October election approached. Former Prime Minister Stephen Harper of the Conservative Party had maintained a hard line on Syria refugees, claiming national security was more important than the humanitarian crisis. However, popular sentiment began to shift after the photo of a dead Syrian toddler, who had washed ashore in Turkey as his family began to make their way to Canada, grabbed international headlines in September. Yet Harper did not change his tone, deriding the use of the niqab, or Islamic face veil, during a debate and railing against the dangers of Muslim immigration. Trudeau and other Harper critics seized upon this, describing the Conservative leader’s statements as un-Canadian. In the wake of the Paris attacks that killed 130, the Trudeau government has slowed — but not discarded — the refugee policy that originally planned to bring 25,000 Syrians to Canada by Jan. 1, 2016.